On Sunday, October 9, 2016, Doug Perks, Chief Historian of the Jefferson County Museum in Charles Town, will discuss the formation of the State of West Virginia during the Civil War, and Jefferson County’s role in it. In the 19th century, Jefferson County was closely tied to northern Loudoun County, through commerce, family, and cultural connections. Farm families from the Lovettsville area routinely trekked across the “egg path” on the Short Hill, taking dairy goods and produce to sell in Harpers Ferry. Before the events at Fort Sumter in April 1861, the majority in both Jefferson and Loudoun Counties opposed secession. Both counties elected anti-secession delegates to the Virginia Convention that convened in Richmond in February 1861. In an April 4, 1861 vote, the Convention rejected secession by an 85-45 vote, but after the fall of Fort Sumter and President Lincoln’s call for volunteers to suppress the rebellion, the Convention reversed course on April 17, and voted for secession 88-55. Loudoun’s two delegates remained opposed. One Jefferson County delegate, Logan Osburn, still voted against secession; the other, Alfred Barbour, didn’t vote. 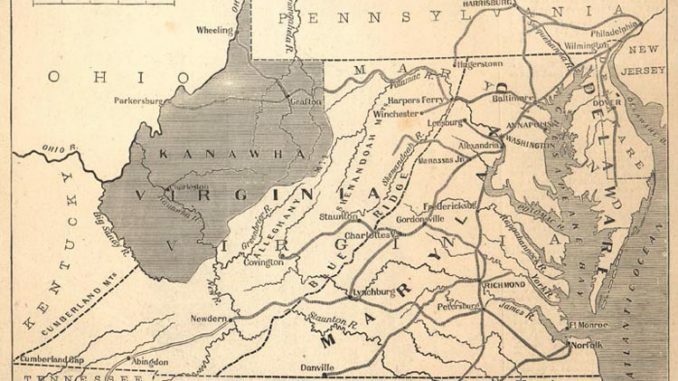 Initially, Jefferson County was not part of the plans for a new state separated from Virginia – first called “Kanawa.” But then why did Jefferson County end up joining the new state of West Virginia, while neighboring Loudoun County remained in secessionist Virginia? Just how did this come about ? And why was it contested for many years after, with Jefferson County’s status being taken up by the United States Congress, and eventually even by the United States Supreme Court? Historian Doug Perks will explain how all this happened, in a fascinating story that is of interest not only to citizens of Jefferson County, but its neighbors as well. The program will be held at St. James United Church of Christ, 10 East Broad Way, Lovettsville, at 2:00 p.m. The program is free, but donations are welcome to defer the cost of our programs.